Brown Parker & DeMarinis helps St. Luke’s Hospital boost ER volumes 20%—in just two months! St. Luke’s Hospital was founded in 1873, and is the oldest hospital in Jacksonville, Florida. Joining the St. Vincent’s HealthCare system in 2008, it is now known as St. Vincent’s Southside. St. Luke’s Hospital came to us looking to turn around sagging ER volumes. Although the hospital had just completed several operational enhancements, patients continued to flock to competitive facilities. 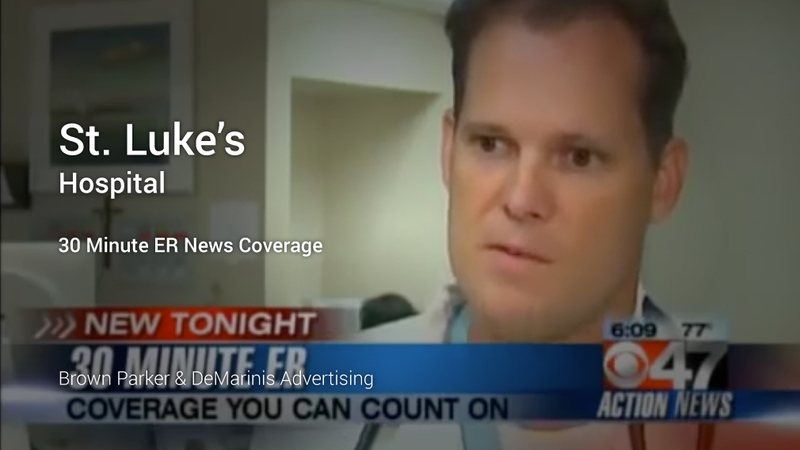 We needed to give patients, clinicians and paramedics a good reason to try St. Luke’s again. In addition to the fear patients feel about emergency rooms in general, they feel an additional level of anxiety because of the uncertainty associated with how long they may need to wait once there. For months, the news media ran story after story about patients waiting for hours in ERs—some critically injured. Working with the hospital’s leadership, for the first time we developed a service level guarantee for ER patients. We then launched an integrated marketing campaign touting the area’s only 30-Minute ER Guarantee. Patients began flocking to the hospital, boosting ER volumes by 20% in the first two months of the campaign and resulting in significant downstream revenue across key service lines. in such a short amount of time. The return on investment has been extraordinary.